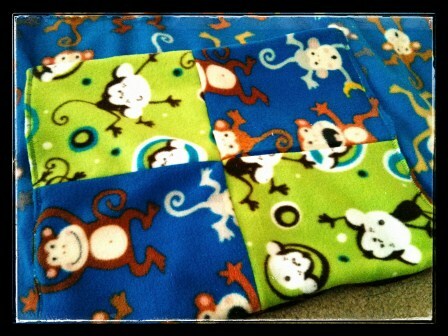 TATE’S QUILLOW: For my nephew’s quillow, I knew I needed fleece with monkeys because he loves loves loves monkeys. Unfortunately, my favorite fabric store didn’t carry boyishly monkey fleece. The monkey fleece I found were better suited for girls. 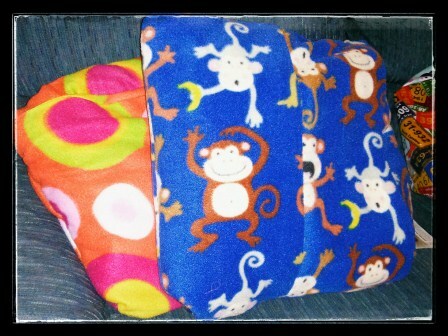 Without monkey fleece, I had no idea what else Tate would like. 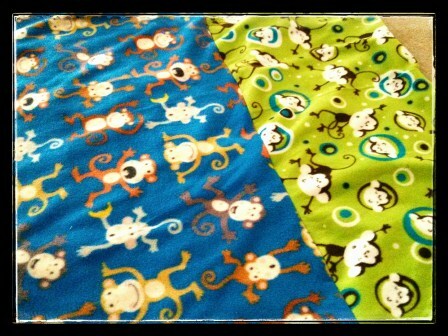 Luckily, I had to visit a different fabric store in a completely different state to find not one but TWO boy appropriate monkey fleece! Yay! The quilty part of the quillow was ready, and I simply cut the monkey fleeces to the appropriate sizes. I used the leftover fleece to create the quillow pocket. I’m actually quite proud of myself regarding the quillow pocket because I didn’t have much leftover fleece. With a little bit of creativity, I cut and sewed the fleece remnants to form the sizes I needed for the pocket. In the end, I’m very very very pleased with the pocket. 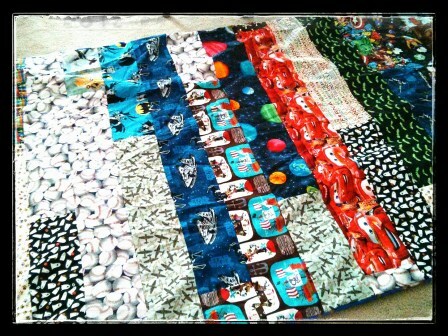 For the quilty part of the quillow, I simply used the strip method, sewing long strips of fabric together. The process is simple and quick, and I love the results. I just hope Tate loves the quillow as much as I do.